In Which We Extend the Turkey Day Challenge…. If you have in fact stepped up to the plate and purchased yourself a bonafide, free range, heritage breed turkey, pat yourself on the back. We applaud and thank you. You still have a few details to tend to however before the star of your dinner makes his grand entrance. If you don’t pay attention before the Big Day, your heritage breed turkey could throw your whole game off at the worst possible time. Just ask my mom – she’s still a bit out of sorts about the turkey I contributed last year. At the end of the day, it was hands down the best turkey we remember. It was just the struggle to get to the end of the day my mom remembers….. her timing was thrown WAY off, lol. Heritage breed turkeys aren’t like the Franken-turkeys (Broad Breasted Whites) we are familiar with. Since your Heritage Breed bird actually had a life, it will need to be cooked a bit differently than your Butterball. Often, heritage turkeys are sold fresh. Either fresh or frozen, bring the bird to room temperature before cooking. You won’t have to cover your heritage turkey’s breast with foil to keep it from drying out while the rest of the bird cooks. Their smaller breasts create a better balance between the dark meat and white meat, which means roasting a bird to perfection is much easier since white meat cooks quicker than the dark meat. If the breast is covered during roasting, it should be done with oiled parchment paper — not foil — which is then removed 30 minutes before the turkey is finished roasting. 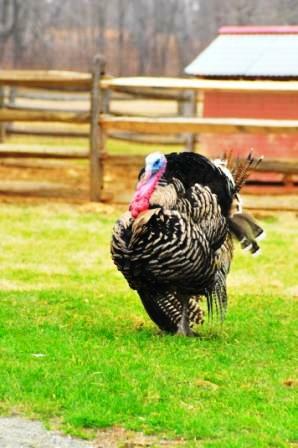 Heritage turkeys are also much leaner and smaller than sedentary commercial birds. This means that fast cooking at high temperatures is a better method than slow roasting — another big plus since you won’t have to set your alarm to get the bird in the oven to be done in time for an early dinner. Heritage turkeys should be cooked at 425-450 degrees F until the internal temperature reaches 140-150 degrees F. Butter or oil can be added under the breast skin to add flavor and moisture during roasting. The USDA recommends turkeys be cooked to 160F-180F, but these temperatures will dry out a heritage turkey. Heritage birds carry much less disease and bacteria than commercially raised birds and do not need extreme temperatures to make them safe for consumption. That being said, use your own judgement – I am not a microbiologist and am just passing along what I have learned. I tend to be less fearful than the average bear about these sorts of things. Cook any stuffing first and put inside the heritage turkey before roasting. Due to the reduced cooking time, your stuffing won’t become fully cooked. 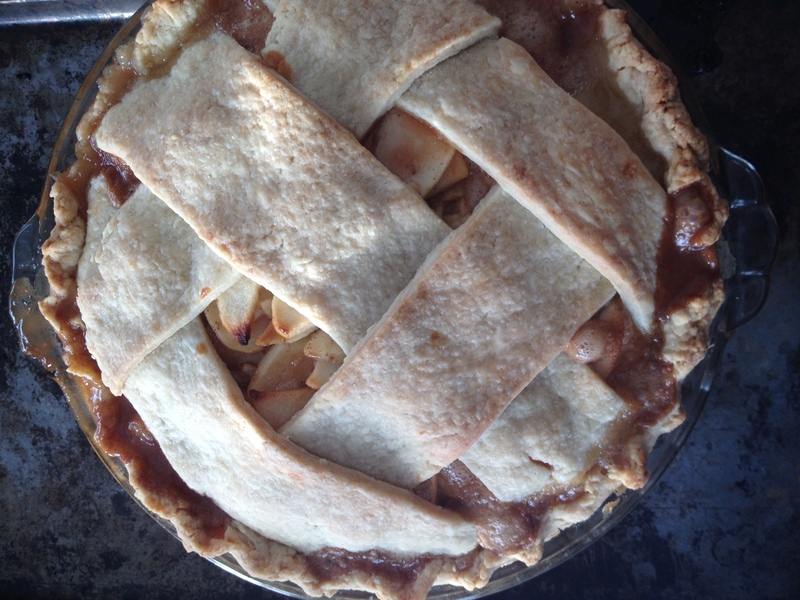 Alternatively, try adding a quartered orange, apple and/or pear inside the cavity instead of stuffing. Next, be prepared to make use of every precious bit of that prized bird since you have invested about ten times what you would have paid for that tragic supermarket specimen. I love this post from CheapHealthyGood.blogspot (dot com) :1 Chicken, 17 Healthy Meals, $26 Bucks, No Mayo for inspiration about what to do with all those leftovers. I take issue with one fact only, well actually two. She’s left out the stock you’ll want to make from the carcass, and she used a Perdue store bought bird. Oh, plus the fact that we’re talking Turkey here… these things do not diminish the awesomeness of this post one bit; and, with the addition of your stock, you can make at least one if not two more meals raising the total to a possible 19. This recipe is really more of a guideline adapted from Darina Allen’s great classic, Forgotten Skills of Cooking. Stock will keep for several days in the refrigerator. If you want to keep your stock longer, boil it up again for 5 -6 minutes every couple of days; then allow it to get cold and refrigerate again. Stock also freezes perfectly. I use it to make risotto, use in place of the water in rice, soups, sauces and gravies. Am I cheating if on Meatless Mondays I make veggie fried rice using rice I’ve made with chicken or turkey stock? You decide…. I’m doin’ it anyway. Chop up the carcasses as much as possible. Put all the ingredients into a large pan and cover with about 3 ½ quarts cold water. Bring to a boil. Skim the fat off the top with a tablespoon. Simmer for 3 – 4 hours. Strain and remove any remaining fat (I strain into a bowl and place the bowl into the fridge overnight. The fat hardens on the top and is then easily peeled away and discarded. Do not add salt; you can do so later depending on the recipe you use your stock in. Slightly Advanced: For a stronger flavor, continue boiling down your stock in an open pan until it reduces to about half of the original volume. Again, do not add salt. I hope you’ll consider it a challenge and apply a little Iron Chef style of ingenuity in the days following Thanksgiving….. We’d love it if you’d share any of your best tips for Turkey Day leftovers!